Does literary quality mean that a writer has to have a strong authorial presence? I bring this up because Beyond Magenta is a wonderful nonfiction book. It’s easily one of the strongest contenders for this year’s YALSA Award for Excellence in Nonfiction—but will it be a serious Printz contender? I guess what I’m really struggling with is how to asses a book that is shaped largely by the personal narratives of individuals told in their own words. 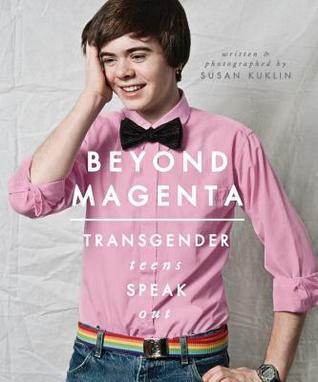 Susan Kuklin has edited and arranged the six stories that appear in the book but I keep thinking that the things that moved, enlightened, and challenged me in Beyond Magenta were the teens’ voices—their stories and their analysis of their identities. Not all of the Printz criteria need to be applied to declare a book exceptional but I find that theme and possibly design are the main elements to examine for literary quality here, and I’m not sure that they show the very best work of the year. What makes this book outstanding is the way that Kuklin allows the teen voice to shine, with very little authorial interruption. So if we’re considering voice, can we call the work extraordinary if the author’s role was to preserve the subject’s voice by presenting their words? Maybe I’m diminishing Kuklin’s role, but when I think about what impressed me in this book, I think of Christina, the girl who came out as transgender while attending an all boys Catholic school. When she talks about her experience, she’s able to convey her bravery and her fragility at that time. Those are her words; she’s done the hard work of thinking about who she is and what she’s been through and is able to share that with the reader. Similarly, Cameron is incredibly thoughtful about their experience (“their” is Cameron’s preferred pronoun), exploring male privilege, the way that clothes reflect and influence their gender identity, and other aspects of what it means to be a trans teen. Cameron’s exploring those themes, and it feels like Kuklin is facilitating more than creating. In terms of Printz criteria, the easiest element to trace back to Kuklin is theme. The importance of physical appearance to a transgender teen is a recurring theme among the six teens profiled. Nineteen-year-old Mariah talks about the common wisdom that “it’s what’s inside that counts.” She astutely observes—and she’s not alone in mentioning this—that feeling good about one’s appearance is a major part of their confidence building. Furthermore, some of the teens interviewed talk about their rejection of society’s gender binary system, feeling more comfortable living in-between the two. These ideas are powerful and can inspire endless debate and discussion. To be so prominent, Kuklin surely edited the interviews to bring those ideas forward as a common thread, in addition to honoring each individual’s personal take on their gender identity. Beyond Magenta is powerful and important reading. It’s a book that every teen should read. But all of these questions I have make me unsure if it has the literary chops to be a Printz winner or honor book. I’d love to have more debate about this (from both sides) in the comments, so tell us what you think! I really liked this one, but it definitely makes me think hard about what ‘literary’ means in the context of the Printz. The teens in Beyond Magenta are interesting and their voices are so strong, but the inevitable consequence of their voices coming out so strongly is that it’s a book that often feels rough and raw and messy. It is a better book for being rough and raw and messy! A book that felt more clean and polished would not be, I think, as honest to the variety of different experiences that these teens go through. But it challenges my expectations of what literary non-fiction should look like. I am looking forward to finding out what the Real Committee makes of it. I haven’t read this one yet, but I’m confused by your comments about voice Joy. That sounds to me like you’re saying that the only “voice” we can consider is that of the putative “author.” But why can’t we consider the voices of the subjects as well? As I said, I haven’t read BEYOND MAGENTA, but I have read Kuklin’s previous book NO CHOIRBOY, and the heart of that book is also the voices of her subjects–in this case men who were incarcerated as teens–and I can’t think of any reason the literary-ness of that book would rest more greatly on Kuklin’s editorial decisions and relatively minor prose contributions, rather than on the intensely profound voices she captured. To take a totally different example – what about a multi-author short story collection. Is the “voice” we are looking for the editor/compiler’s, or the individual voices of the short stories? Seriously though, my instinct is to say that outstanding quality with regard to voice in a book (fiction or nonfiction) has to rely on a writer who is making specific language choices at the sentence level. The example you give of a multi-author short story collection falls within this realm because there can be consistently strong voice writing across a single collection. (Personally, I would say editor’s voice is less important there). However, the flip side of this argument–and the reason why I’m still thinking about this one–is the point that you make. Is Kuklin’s work as editor just as praise-worthy because she preserves and captures the voices of her subjects? I’m not sure. If you ask me tomorrow, I might say “yes.” Today I’m still inclined to reason that even though it is so strong here, voice is a difficult topic for discussion (in terms of Printz criteria) because there is so much gray area. The teen voices are amazingly clear in the book, but is that because the teens themselves are incredibly articulate? Could be. Or it could be that Kuklin was able to shape a jumble of ideas into coherence while faithfully presenting the essence of that teen’s voice, capturing what it’s like to be in conversation with them while streamlining their thinking into readable ideas. Great points, great questions. Of course, I think I’m going to continue to mull this one over. Also, you should definitely add this to your “to-read” pile. It’s extraordinary and I would be shocked if it’s not in the conversation for the YALSA nonfiction award. I definitely understand where you’re coming from, Joy, but don’t the infamous Printz Award Policies and Procedures allow us–nay, encourage us–to think about quality in new and unique ways? I still don’t think this one could crack my own top three, but I do think it’s too easy to write it off simply because she relies too heavily on the voices of her subjects. Excellent point. And for an extraordinary book, I would argue to stretch our definitions. Is this that book? Maybe. Although I love it, I need to hear/read much more compelling evidence of literary merit. Regardless, I certainly love thinking about and discussing what we mean when we talk about “literary.” Because we absolutely should be open to new definitions and ideas. Then, too, the P&P explicitly encourages us to seek out diversity and I would argue that this book illuminates the lives of transgender teens in such a way that it blows the doors off of any of the transgender fiction either this year or in the past.